We all encounter and have to deal with zip files in our day-to-day work. Sometimes a colleague sends you a zipped archive of documents from last year, and sometimes you simply want to reduce the size of your folder so it can work as an email attachment. How do you open a zip file on a Mac? Or what’s the best way to do that? There are, of course, several methods for creating archives, such as built-in utilities, Terminal, and third-party apps. Below, we are going to explore all the best zipping and unzipping options available to you. 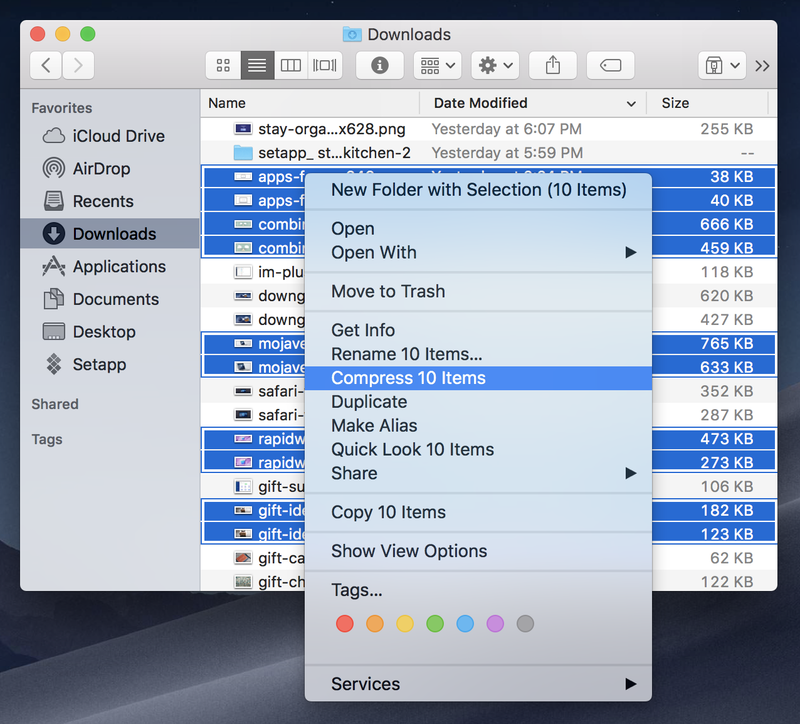 Before we talk about some special apps and tools, we need to mention your Mac’s simple Archive Utility, stored in the Applications > Utilities folder. 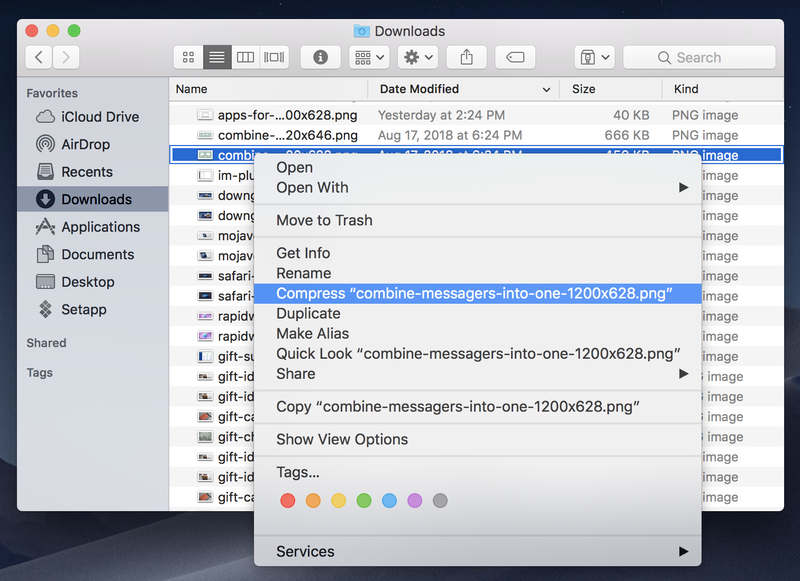 Yes, basic file compression is built right into macOS. Its functionality range is limited, but it’s good enough for quick zipping and unzipping of files and folders when you need to look into files someone has sent you or upload an image folder to Dropbox. Right-click on the folder and choose Compress. Done! Compressing multiple items works just about the same. The only difference is the names of the items that appear in the pop-up menu and the name of the zip file that is created. When the compression is finished, the compressed items will be stored in a file called Archive.zip, which will be located in the same folder as the original items. Once again, a progress bar will display. When the compression is finished, the items will be stored in a file called Archive.zip, which will be located in the same folder as the original items. Sadly, compressing and decompressing files and folders is the only thing the default Archive Utility is capable of doing. If you want to preview the contents of an archive, merge or split archives, protect archives with passwords, or use an extended range of file types (e.g. RAR), you’d need some special tools. Fortunately, there are apps that can do all the above. It’s true that some lack of the Archive Utility’s functionality can be fixed by using Terminal, but it’s not exactly user-friendly or straightforward. A better way to go is using apps like BetterZip and Archiver, which are easy to use and give you all the features you could imagine. BetterZip covers all the functionality of the Archive Utility but also packs lots of high-end features you’ll find very useful if you work with zip archives regularly. It allows you to add comments to archives, delete files from archives without unzipping them, and is fully AppleScriptable, so you can integrate it into your workflows. BetterZip will also suggest passwords for you to use to encrypt archives, and you can tell it to automatically trash archives once you’ve unzipped them. Archiver is another great app for compressing and extracting files. If you find that you’re uncomfortable with BetterZip’s detail-heavy interface and would rather use a tool that has a simpler, more minimalist user interface, you should try Archiver. It’s sort of midway between Archive Utility and BetterZip in terms of features, but has a more approachable design than the latter. Apple's Archive Utility doesn't provide ZIP archives' encryption with a password. However, there is a way to do this if needed. Press Enter and supply the password to use for the archive. The encrypted file will appear on your desktop. To set it up, open Preferences and click on the Presets tab. If you want to use the same password for every archive, type it in the box beneath. If you’d rather choose a password when you create an archive, leave the box blank. Drop a file or folder onto Archiver’s main window. Choose what type of archive you want to create, then give it a name. Click Encrypt, if you want to encrypt it, and choose the level of encryption. Then press Archive. Select Quick Look from the drop-down menu. The app will take over and show you a list of the files in the archive, with details of their names, types, and sizes. If you want to see more, choose Open with BetterZip. The archive will then open and you can preview the contents of each file, all without extracting it. Click the Add button in the toolbar and navigate to the file or files you want to add. When you’ve selected one or more files (Command-click for multiple files), click Add. The new files will be added to the existing files in the archive. Click and hold on Save and choose Clean and Zip to create a new zipped archive consisting of the existing files and the ones you just added. Isn’t it annoying when you need to send an email but the attachment is too big? 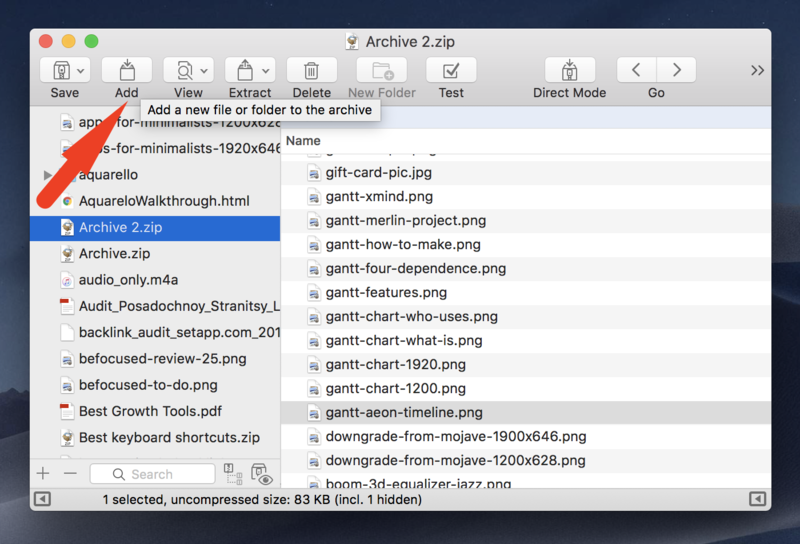 An easy way out is to split your zipped archive into smaller zip files with the Archiver app. You don’t have to extract the whole folder with hundreds of files if you just need to get one file out. Just use BetterZip. Click and hold on Extract and then choose “Extract to” and navigate to where you want the files to be saved. Or right-click on the file and choose Extract Selected. Additional tips: Once you’ve extracted all necessary archives, you might find you have a rather cluttered desktop — if that’s where you chose to extract them to. Declutter will fix that for you. It will organize your Mac's desktop and make it neat, allowing you to create color-coded smart folders. Declutter can even do it automatically, following rules you set up. 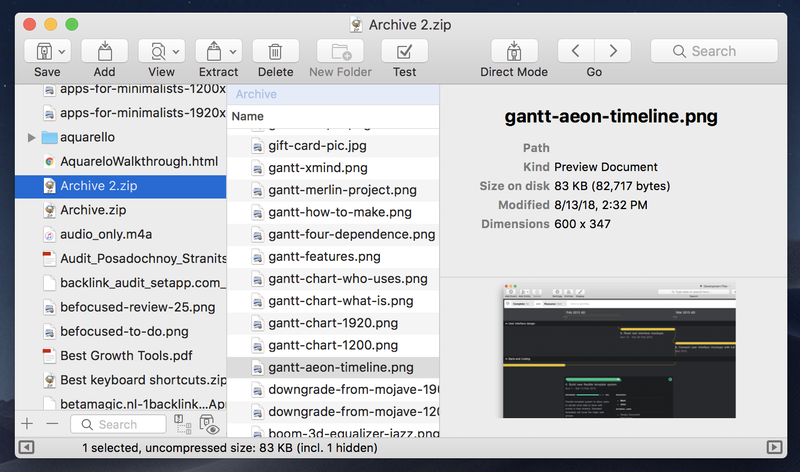 While macOS built-in Archive Utility handles the very basic zipping, Archiver is able to take on some advanced work and features an intuitive interface. BetterZip, on the other hand, is a pro-level tool that includes many more features. Now, with your folders unzipped, archives zipped, desktop clean, and all the files properly named, you’ll spend less time looking for the right files or sharing them with others. And this all is easily possible with Setapp and its collection of over 120 useful macOS apps ready to set you on your most productive path in any situation. Try all of them free for seven days and see for yourself!